The Georgia Independent Schools Association (GISA) annual conference happened today in Atlanta. This is my first year attending the conference because this is the first year my employer has been a member. 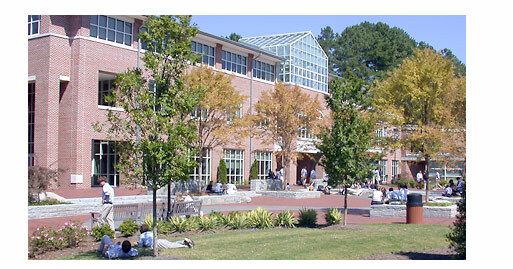 Above: The Lovett School in Atlanta, host of the GISA Annual Conference. I attended a math session in the morning and presented my own del.icio.us talk in the afternoon. “Data Collecting and Modeling in Algebra”, presented by Jill Gough from the Westminster Schools. I chose the topic because I saw cross-disciplinary opportunities, a good science-math match, using graphing calculators, and a topic especially for middle school (but functions for algebra in high school). I was correct. This was a great session. Jill made me want to get a set of TI-84 Plus calculators for my class and go to town working the graphing functions. My middle school pre algebra class is just starting to use scientific calculators…which makes me think the graphing calculators are best introduced later. Use the temperature example. Put the data from all kids into the calculators. Set it up to plot degrees Centigrade on the X axis and degrees Farenheit on the Y. Your goal is to find the equation of that line. Let the students find the data themselves: 1 C/F pair per kid. About 10 minutes in the computer lab should be enough. How do you get the students to find the slope of the line in a C, F graph? Guess, check, and revise works well for middle school students to learn the concept of slope. Jill also asks students to choose two well-separated points to find the equation of the line. I’ve been teaching graphing in Excel to my pre-algebra class. While this particular presentation dwells on the use of a graphing calculator, I could implement it in Excel (ahh, the joys of “owning” the computer lab). However, for those with graphing calculators, this is an awesome application, unmodified. I love the implications for using the graphing calculators. Sad sidenote: Jill said that in her experience the graphing calculators are rarely used in middle school science rooms. Also at GISA, I ran into Dana Huff in the cafeteria at lunchtime. She already wrote in her blog about making online connections into real-world connections, so I won’t elaborate here other than to say I agree — here’s someone I “know” but have met only once. So, I showed up in the cafeteria at the host school for today’s conference. Lunch is provided to attendees and I was prepared to hunt down a vending machine because I keep kosher. To my pleasant surprise, there on a back table are a pile of lunches labeled kosher. I asked and was told the lunches were not reserved. Way to go, GISA! I got to eat a meat lunch, which is incredibly rare to me. My afternoon session on social bookmarking went well. I got some great questions — my favorite was “what happens to dead links?” I found two options, which are both client downloads: fresh delicious and dead.licious. Another teacher wanted to know if del.icio.us did anything to weed out “bad sources” such as Wikipedia (her words, not mine). I was a little shocked by that second one. I heart Wikipedia! Maybe next time I’ll present a session on using Wikipedia in the classroom.